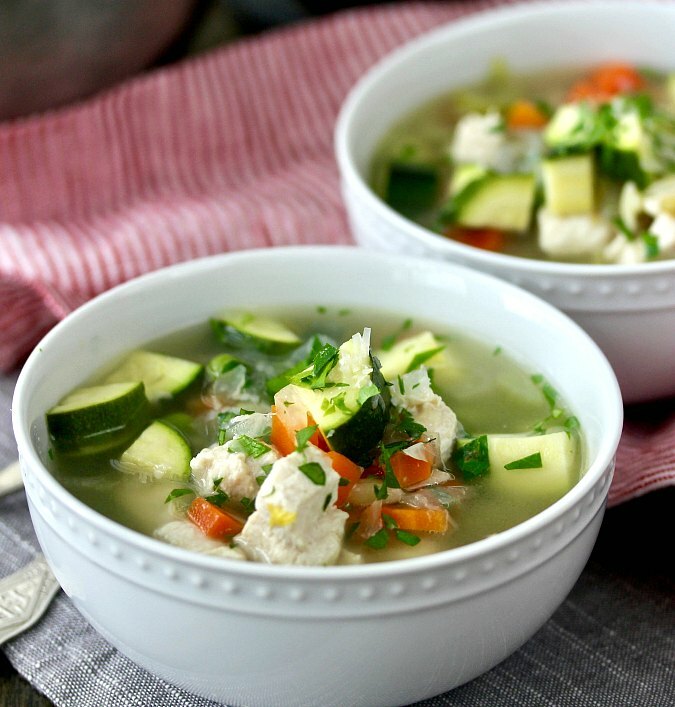 This chicken and orzo soup is also loaded with veggies and herbs. It's super light and flavorful. How do you make chicken and orzo soup in the Crock Pot? This is not a "dump and run" slow cooker recipe. 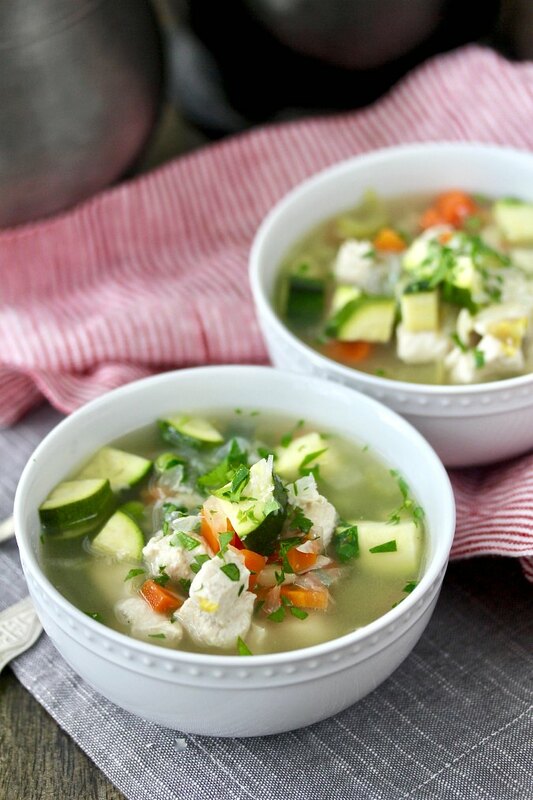 Instead, you can use your Crock Pot to make this soup in under four hours! To make this soup, you cook broth, chopped onions, chopped carrots, and diced celery for 3 hours on low in the slow cooker. 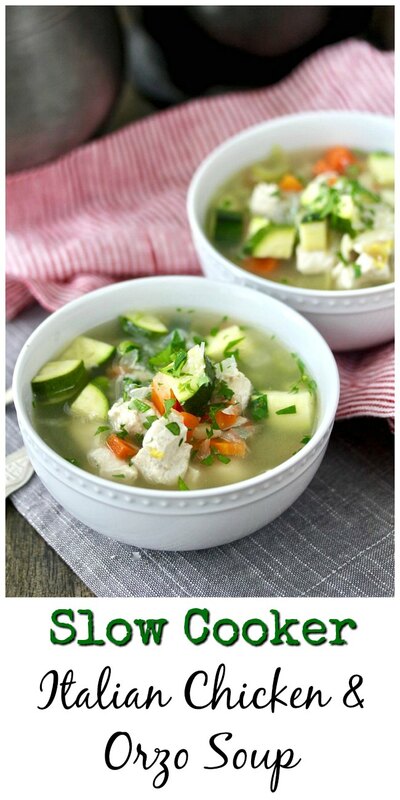 Next, you cut boneless skinless chicken into 1/2 inch chunks and add it to the Crock Pot, along with chopped zucchini, orzo, and frozen peas and cook them in your slow cooker for 30 minutes. Once the orzo and chicken are cooked through, stir in some shredded Parmigiano-Reggiano and a handful of chopped parsley and serve straight from the slow cooker. Orzo is actually a pasta that is shaped like rice. I used to think that it was a variety of rice. Silly me. If you don't have any orzo on hand, you can break up some spaghettini into small pieces instead. If you'd rather add larger pasta or noodles, cook the the noodles separately and add them to the finished soup. We loved this soup. It's light, full of veggies and herbs, and perfect for any season. This month the Soup Saturday Swappers, started by A Day in the Life on the Farm, are sharing Italian soup recipes. a theme chose by Kathy of A Spoonful of Thyme. Check out A Day in the Life on the Farm for everyone's Italian Soups. Add the broth, onion, carrots, and celery to a 5 to 7 quart slow cooker. Cook on low for 3 hours. Add the chicken, zucchini, orzo, and peas. Cover and cook for an additional 30 minutes. Add the salt and pepper to taste, and stir in the Parmesan and parsley.